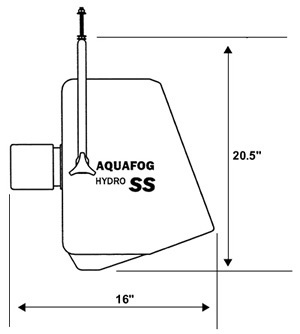 Compact and versatile Aquafog Hydro atomizing fans can handle a variety of indoor/outdoor humidification or evaporative cooling applications. The nozzle-free fans can atomize ordinary water supplies into a very fine mist-like-fog. Utilizing high-speed centrifugal force and air flow, these units can propel a misty-fog stream up to 20 feet away. Unlike other fog systems, all Aquafog foggers can accept ordinary water supplies, even well or pond water without the risk of clogging. The secret is in the nozzle-free, self-flushing atomization system that forces liquids through passageways in the fan blades, atomizing as the liquid exits the blades. 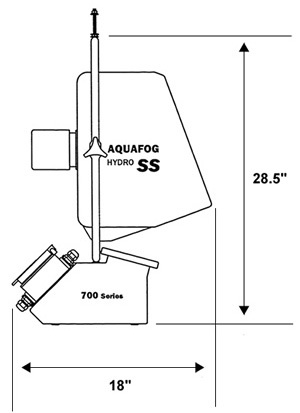 In addition Aquafog do not require high-pressure lines. Ordinary pressurized water lines are more than enough, and units can even be gravity-fed or connected to low pressure supplies like reverse osmoses (RO) systems. 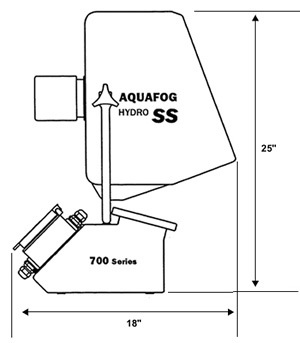 By eliminating specialized pumps and filtering equipment, Aquafog saves time and reduces costs. The unique atomization process combined with the fan's forced circulation provides a quality fog with great distribution. The Hydro SS 700 is engineered to withstand humid conditions as high as 100% relative humidity. Units are constructed of impenetrable components like Nema 4 boxes and connections, all 304 stainless steel hardware, UV stabilized polyethylene housing and precision, high strength injection molded polypropylene components. 14 foot power cord with grounded three prong plug. 1,125 Cubic ft per min. 1,125 Cubic ft per min. 1,125 Cubic ft per min. About 500 sq ft. for Humidification Applications. About 300 sq. ft. for Evaporative Cooling Applications. About 500 sq ft. for Humidification Applications. About 300 sq. ft. for Evaporative Cooling Applications. About 500 sq ft. for Humidification Applications. About 300 sq. ft. for Evaporative Cooling Applications. If your primary interest is in evaporative cooling, this pre-wired thermostat combination water solenoid control is what you may need to automate your SS700 Direct Feed unit. If you want to maintain very high humid environments above 85% (RH) relative humidity, then the Cycle Timer may be the control you are looking for to automate your SS700 Direct Feed humidifier. Heavy Duty Mounting Supports for the SS700 fogger. This pre-wired humidistat is an ideal means of control for any electrically based misting system and applications requiring 85% or less relative humidity. Incorporates a fast-acting man-made sensing element with large, easy access control dial. This product ships via Standard Ground Service. I just purchased this SS700 unit to replace TurboXE model that finally croaked after 7 years of hard labor. About this unit...PROS:1- Easy to install! No hard wiring necessary like the larger XE model.2-VERY quiet! The XE sounded like a helicopter landing in the backyard!CONS: I purchased this unit to raise the humidity and provide some fog in an orchid greenhouse, which is 14' W x 24 long. The XE model would fill the ENTIRE greenhouse (40' long) with luxurious fog to the point that you could not see one end of the greenhouse from the other.This unit has only about 25% of the power that the XE had. It only blows fog about 15' out and 8-10' wide. The fog is not as fine as the XE... more like a mist actually. I'm not sorry that I purchased it, but I DO miss the XE! At least I'm able to raise the humidity level again which is crucial for the orchids.In conclusion, This is a good quality machine, but make sure that you are not under-doing it for the square footage that you have to cover! humidifier works very well, the flow meter will send LOTs more water to the unit than it can use (if valve is fully opened and connected to a pressurized line) the whole system works very well, pretty quiet, with a lower rpm fan they could make it silent(high rpm needed to atomize the water from the looks of it). the cycle timer works well also. i havent gotten to set up the product just yet but did a couple quick tests in a larger room than it will be used in, it seems to crank the humidity right up quickly. when you stand next to it its not the quietest thing in the world, the fan spins very fast to atomize the water other wise it would be silent. but if u go into another room it is quiet. doesnt have penetrating noise, just a higher frequency. the cycle timer is nice too ;) gives you plenty of timing options, seems sturdy/ good quality. I bought these item to keep my grow room humid so my seedlings would stay moist and retain water rather than drying out. Its worked perfectly, not only is the room the humidity i want it, but all my seedlings have shown rapid growth!! !